Here is the promised interview with my husband! My husband is a scientist much like myself. His interests are largely gadgets (currently his kindle) and chemistry. As a brief, I told him that the majority readership of this article will be black women. He is very much a straight talking person and I refuse to censor him. Here are some hubby'isms (stuff he says because we laugh when he says it). 1. Hat - Means weave or wig. In his view, weaves or wigs are more like hats. Q: What is your general view on natural hair? A: Natural hair is very unnatural to many black women. A: From my experience, many women devote a lot of time and money to looking after their hats (aka weaves and wigs). In order to see a woman in her so called 'ugly' state with her natural hair, you will often have to be very close to her, her hairdresser or she will have to trust you. Q: So do you dislike fake hair? A: As odd as it sounds, I really think that black women have done an excellent job of hiding the fact that sometimes what you see is not real hair. Prior to meeting you (that is me, Jc), I thought that black hair pretty much grew in the same variety that you see white hair............meaning straight, wavy or curly. I definitely knew that natural hair like yours (my hair is type 4) was normal but I also thought straight hair was too. I did not know that quite a lot of the straight hair was relaxed. I never assume that a woman's hair is fake unless she has told me. I have no opinion on it because I do not know if it is fake or not. Your sisters (that is Jc's sisters) are one of the few people who showed me the tracks in their hair and explained what a weave was. All I am saying is that when money and time is spent on the hats (weaves), it does mean that this type of hair is more normal to the women. Natural hair is not the priority and is not the norm. Q: Why do you think natural hair is not that common to see? A: I think many times we do what our parents do and what their parents did before them. If a woman grows up seeing her mother with straight hair or weaves, she learns that when she grows up, this is how she will style her hair. Embracing natural hair is an educational process where the person has to learn to see and think differently. Q: Do you think natural hair is beautiful? A: It does not matter what I think. The general idea is that the wearer of the hair has to feel it is beautiful in order for it to be. Q: What would you say to a woman who wanted to go natural but was afraid of society's perception? A: First of all I would say that we as humans tend to home in on opinions that we ourselves share. If the woman feels that she looks ugly, she will easily hear the critics loudly. If the woman feels beautiful then she will hear the praise. Q: What do you think about the argument that black people are forced to conform to a white stereotype in terms of hair? A: The reality is we are all very self absorbed and as we walk down the street, the vast majority of people will not be bothered in the least about a passing stranger's hair. I think most people really do not care, possibly an employer could object if you dye your hair blue or green. Then again, blue or green hair is necessary for some professions. 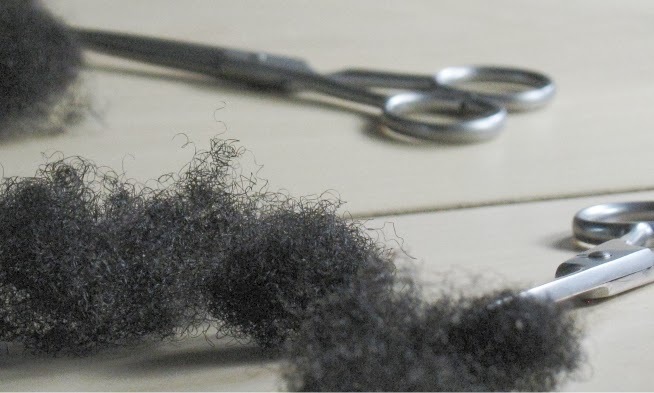 Q: There is a popular post on the blog about an unsupportive husband who really dislikes his wife's natural hair. As long as it is in braids it is ok, if it is not then he is not happy. What advice would you give to him? Q: Do you think more women should be natural? A: No, I think women should do what makes them happy. Ultimately the perception that each individual has of themselves is important as it will affect how they see the world. If a woman is happy with her self image then it will be clear. If she is however unhappy then she should have the courage to try something different. Q: Where do you think women should get support from when going natural. A: Don't ask old friends for new opinions (eh what?.....asks Jc). If you hang around women who are not natural and your general hair discussions involved which new hat (aka weave) to try then they will not necessarily be the best people to approach for advice. Going back to my original point, the best support comes from self. Often that decision to go natural is an individual decision and is often made to create happiness. There is nothing wrong with changing your mind and making a different decision but if doubts creep in that do not originate from the self, then it is necessary to remind yourself that the natural hair decision was made for yourself. Q: Do you think it is hard to manage natural hair? A: It is as hard as you make it. I think natural hair is easiest to take care of when you do not deviate too far from your natural texture. The more you try to change it, the harder the management becomes. Q: What do you think I do to manage my hair? A: Erm I think you wash it, condition it...........oh and coconut oil, lots of coconut oil. Q: I was just a tiny bit irritated by a comment on a blog about a man describing his dislike of hair bonnets, what do you think about them? Q: This is a trick question, do you think I would ever not be natural? A: I think that natural hair is a significant part of your identity. I really cannot envision a time when it would make you unhappy, so no I do not think you would change. I would support you if you did decide otherwise but I have lost count of the times that you (that is me Jc) have said 'I love my hair'. Q: Ok a reader asked what scent do you like in my hair? Q: What is the funniest thing you have heard about natural hair? Q: Growing natural hair is a big deal to some women. A: Yes because they keep pulling it out. Your husband is hillarious! Totally loved him calling weaves/wigs hats- essentially that's what they have become! Black women now associate their weave/wig as being an essential and core part of their identity. The problem is the inability to distance themselves away from fake hair and embracing their natural hair. Great interview JC. I love that he doesn't get trite or try to be PC. Just his straight and honest opinion. Hair is a choice and my current choice is to relax mine. When I get bored I'll probably chop it off and go Natural. I see no boundaries or limitations and luckily my hubby loves me whichever way!! Best interview on natural hair that I read ever! Love so many of his comments...all of them really. He's def smart & funny! Camille - How very insightful of you! He has a German accent actually. It is funny because sometimes when he cannot find the word in English, he will just make it up or call it by the German name. He does make me laugh. Hubby is cleary very bright! Love it, he's hillarious too. This is a GREAT WAY to get a man's perspective on natural hair...it is very true, I agree 100% with his views on natural hair being "unnatural" in the sense that it is not widely practiced. Quite ironic. I know Mo'nique. I really wanted to disagree with him and wanted to say natural hair is the way forward but he is right that by and large, it is not that common and consequently it is not that normal. Ironic indeed. Love it! That's what's known as a completely unvarnished opinion. :) Thanks to you both for sharing! I love this interview!! Great mix of humor and sound objective point of view! Oh, I simply loved reading this interview! Your hubby has very insightful, honest comments about natural hair. It's refreshing when a man understands that how a woman decides to wear her hair should be about HER, not her man or anyone else for that matter. Truly, if a woman feels confident and beautiful, no matter how she chooses to wear her hair, others will feel that vibe from her. I will definitely be passing the compliments on to him! LBell - I like that 'unvarnished opinion'. Must use it in future! Mikimu - He is indeed honest! I do agree confidence is really important. Hmmm.........your positive reception to him makes me think that perhaps I should have him here more often. Ask Mr Jc column? "Erm I think you wash it, condition it...........oh and coconut oil, lots of coconut oil. " and "(Shrugs his shoulders) Erm.....I like that your hair always smells clean? (said as a question)"
I loved the part about coconut oil, lots of coconut oil - I think that has to be the #1 'product' you talk about/promote/love out of everything, rather anything I can think of! I also like the answer 'do you think natural hair is beautiful' because I have that philosophy in life in response to anything someone else is doing - what I think isn't important, what you think is. I apply this to my own life when I make decisions for myself too. You can't please everyone all the time, but you do know what makes you happy and if you do that every time, at least you know one person will like it. I looove this interview! His humor and also what he said is so true. Personally I've never seen my mother with her natural hair, nor her sisters and she has at least 8 or 9. I also love how he said that everything should come from within and women should do what might take them happy!!! Love the interview..
LOL...My favorite was when you said growing hair is very important to women and he said "Yes, because they keep pulling it out." Hilarious! Thanks for all the comments. I told him the post was quite popular and he said....'Oh why?' He is funny. I love this. It's so funny, especially the "coconut oil... Lots & Lots of coconut oil." LOL! adorable! I loved this interview, thanks for sharing him with us. Great interview! I love his honesty. I imagined him having an Australian accent for some reason....? I loved this interview particularly the bit about coconut oil. I sensed that his first language was not English too, but I liked his view on natural beauty, which was essentially, that it did not matter what he thought but hinged more how one viewed oneself. Very perceptive. That was awesome! I really enjoyed reading it. I am going to share this with my husband. Thanks Jc and Mr. Jc!!! just found your blog today and I love it....a lot of great information. Sorry to burst the bubble and be a bit of a Debbie Downer, but I think it's VERY hypocritical of JC to post this interview, and of so many ladies to be so omg yay he's so funny, when many of you were complaining to the high heavens about similar interviews on BGLH and Curly Nikki. The most common coment was "why should I care what some stranger, especially a MAN thinks." Well perhaps JC should care about this particular man, because he is her husband but to the rest of you ladies you odn't even know him. For God's sakes you don't even know JC's last name! The natural hair community is honestly the most hypocritical preachy group of women I've ever come across. Anon I think if you actually bothered to read this interview you would see that my husband clearly stated the exact same thing that you just said.......his opinion does not matter! This is the reason why this interview resonates so well with women. The very reason I decided to interview my husband was those interviews I read on BGLH and the associated blog (Confessions of a Vixen?). I commented on BGLH too that the interview sucked (I am not often a harsh critic but it was like reading a teen magazine). I also commented on BGLH that there was a lack of something genuine in the interviws. It was as if these men (not all) were speaking about natural hair like it was something you see on TV. I wanted a real interview with someone who had seen the positive and negative side of natural hair. I wanted a real interview with someone who had immense respect for women. I wanted a real interview with someone who could articulate themselves in unbridled fashion. Interviews are a casting project and this is my blog so I demand an intelligent and considered response. This is why my husband is a perfect fit to tell it like it is. Finally of course you can complain about 'Jc' but you place your comment under the very 'revealing' name of Anonymous. I guess you and I both know a thing or two about privacy? So what is your last name darling? Anon, I have to draw a line in the sand before an unnecessary argument develops, so no I will not do endless back and forths. The core reason I take issue with your comment is because you DO NOT criticise THIS post. You criticise people for liking this post. Let me repeat that, you do not criticise the interview..........you find fault with people liking the interview. Get back on topic, tell me, what did you like or dislike about this interview? As I read the interview, I was thinking that your husband was non-black (having German as a first language doesn't prove this but his comments made me think it was the case-I think most black men have seen a bonnet, scarf, or stocking cap), but I think it's important to point out b/c white men have very different ideas (or perhaps a lack of ideas)about black women's hair. They don't know about the hair hierarchy, and as he pointed out, he didn't realize that relaxed hair was relaxed. I don't know that many men bother to learn the difference between weave vs. real, but I do think most black men can tell the difference between a black woman with naturally straight/wavy hair and one with relaxed hair. Oh, but back to my point. I think it's important to point out his race because I'd just expect a lot of white men to go with the flow that a black woman's hair is something that they just don't understand. I don't know...my friends with white husbands/boyfriends never got any comments from them about going from relaxed to natural, long to short, whipping out the scarf when spending the night, etc. b/c unlike black men, they aren't holding that out as some silly metric by which they are judged (whereas the black man is perhaps hoping for other black men to notice the fact that he has the girl with the long or "good" hair. Doesn't make it irrelevant, but I'd be all of the black men criticizing natural hair are black. I'd just be surprised to find many white men to have an opinion, and in my life I haven't noticed them to (and they'll compliment it in various states). AT - I think your views are a sad reflection of just how much race can dictate people's lives. I am not someone who makes or believes stereotypes. I choose to let people speak for themselves. I will not put words into someone's mouth (for example your comment on black men hoping other black men notice notice that their girl has good hair? Really you think that the entire population of black men is that shallow?). There are hundreds of black, white, asian men who understand women and their hair issues (or lack thereof). There are also hundreds who do not get it. There are black and white men who are guilty of berating women with natural hair. I am not saying your views are not partially corrct, I am saying they do not apply as a general rule and it is totally wrong to impose your view onto a whole race of men (black or white). I did not like that because it is a positive view, it is all in a sudden any more important or different from any of the other views seen recently online. It's hypocritical. Because he agrees with many of us, that his opinion doesn't matter, all in a sudden his view is golden. The interview, when I read it apart from the comments, is a good read, it's funny and all, but it rubs me the wrong way that JUST because it is positive, it makes his opinion better than any of the other *strangers* out there on the net. Actually my answers would have been quite different if you asked me the same questions. His views are quite different from my own and made me rethink my stance from a perspective of a whole person, not just my positive view of natural hair. He is not positive about natural hair, on the contrary he is positive about the whole psyche of a person. I think your belief that others like this interview because he is positive is totally misplaced. I think that people like this interview because his analysis makes you think. As I said before on BGLH, men can have an opinion but it has to come from experience. Experience experience experience. When someone says I don't like hair bonnets or natural hair is cool if you keep it neat.....there is something that yells to me that this person really really has not experienced natural hair. A frank and genuine interview is what I wanted to see and so I got one. Sorry anonymous but for the readers of this blog, this is not the opinion of a stranger. It is the opinion of JC's husband and we love her very much.That makes his opinion important to a certain degree. What makes his opinion even more important is that, it is a well informed opinion. He was not interviewed just because he is a male. He was interviewed because he is a family member ( Yes), an informed person and a respectfull person toward peoples genetics, race and self-determination. Respectfull toward what it takes for a lot of us to decide to go natural. That respect is what makes his opinion very important for me. The BEST male interview i have read so far. damn, I wish I could read the comments right now but i gots to cook dinner. AwEsomE post. Smart man!!! I was thinking over the weekend about doing a chat with the hubbs. Thanks for a few good questions, I might have to use them. Girl, I never went to cook. I had to read the comments. I still luv the interview, I could careless if English is his 2nd language. (are u learning German? )...anyhoo, the hubbs is outta town but I scheduled him to take your interview...and I will report back. lol Tiffany!! Great I look forward to reading your interview. I am learning German. I love my new keyboard with all its fancy German special letters üöäß! Great interview. I enjoy the male perspective on things. Enjoyed this. Your husband sounds just like mine!!!! LOL. A thoroughly enjoyable read. I'm just seeing this today. I have not posted before, but I have to say that this interview was one of the most enjoyable "From his perspective" interviews I've ever read regarding natural hair. Haha I love some of his answers! And I agree with what he's saying, that it's more important that you love yourself than what type of hair or weave you wear!